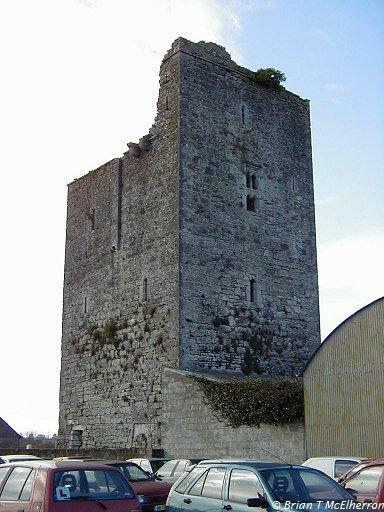 Clara Castle (S574580) is a very fine tower-house about five storeys high. It is vaulted above the third floor and the original oak beams of all the other main floors are still in place. A spiral stairway rises to the left of the doorway and there is a small flat-roofed chamber to the right. The door is hung on the original hinge-stones. The floors of all the small rooms above the entrance are missing but some of the beams are still in place. The small room at the first floor was originally painted blue and one wall has a good Crucifixion mural. The large room at ground level is lit by small slits set within deep recesses, as is the first floor. There is an ambry at the first floor and a brick fireplace built in front of a small window. There is a small chamber in the south wall at the second floor. There is a large two-light window and in the south-west corner a mural passage leads to a garderobe in the west wall. Within the west wall at third floor level is a secret chamber which now has an opening behind a latrine. It is lit by one small window. Above the vault is a room with a fireplace. It is lit by two-light windows in the south and west walls and by single-light windows in the north and east walls. The fireplace is in the east wall. The secret room may be entered from this level through a hole in the floor. From this level the stairway becomes a straight mural structure which rises to roof level although this is not now accessible. However the allure seems to be intact and there are good weepers and crenellations. There is a slopstone over the doorway at the third floor and possibly one leading from the stairway just below this level. The stairway is lit by small slits including a cross-shaped loop just below first floor level. There is a very fine machicolation at roof level. The entrance to the tower is well defended by a small bawn about 3.5m wide and 13m long. It has many small defensive loops. The Church of the Assumption of the Blessed Virgin Mary, Gowran (S633536) was built about 1275. It is a fine rectangular structure the east end of which is roofed. A large central tower is centrally placed and was built in the 14th or 15th century. It is incorporated into the 19th century Protestant church which occupies the site of the chancel of the original church.Within the church are some fine effigies. These include two 16th century Butler tombs, one with the effigies of two armoured knights and the other with the effigy of one knight. Both tombs are richly decorated with weepers although the efffigies are damaged. There is also the effigy of a lady (c1500) and of Ralph Julianus, a parish priest (d.1252). Near the site of the altar is a cross-inscribed Ogham sone. Two other effigies, which for many years stood within the western ruin, have now been taken inside. They are belived to be the effigies of the 1st Earl and Countess of Ormond, and date from the 14th century. Beneath the tower is a large memorial modelled on the facade of a Greek temple. It is made mainly from limestone with some marble. However the inscription is illegible. The north wall of the nave of the original church survives to full height and is crenellated. The north aisle arcade of four arches is intact and there are traces of a possible south transept. 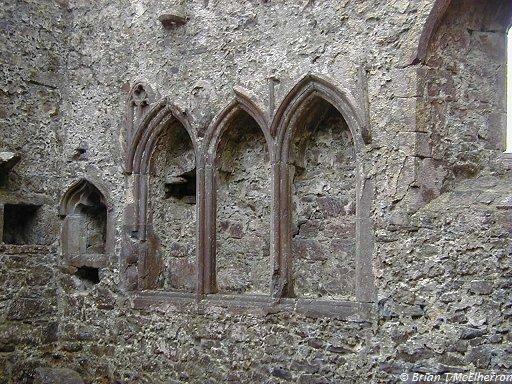 In the north wall above the aisle arcade are traces of two quatrefoil windows now open and two similar blocked windows. The church has many niches, particularly in the south wall where there are four tomb niches and a piscina. There is a south aisle but the arcade is now gone. The east window of this aisle is a fine two-light structure with a decorated hood. The nave has a good three-light west window. A small arch, now blocked, leads under the tower which is buttressed. The tower has good crenellations. The ruined section of the church has many carved masks. There are a number of box-tombs and some good coffin lids. In the west corner is a fine box-tomb, the lid of which is carved with a shrouded corpse. It is the tomb of James Keally and his two wives, Ellen Nashe and Mary White. Some of the panels feature the instruments of the Passion and one of the end panels has a Crucifixion. It is dated 1646. Access to the castle just to the south of Gowran (S632530) is not possible. It appears to stand to full height but there are no crenellations. The doorway in the east wall is now blocked and it was protected by a machicolation, remains of which can been seen at roof level. There is a latrine chute exit at the base of the south wall near the west corner and this was also protected by a machicolation. The north end of the castle rises above the level of the rest to form a turret running the full width of the building. There is a fine mullioned and transomed window in the north wall. At the top floor there are some good two-light windows and there is a slopstone in the west wall. At Dungarvan Church (S615487) there is a fragment of a tomb cover with a double effigy in miniature. The figures flank a Crucifixion. Fragments of a decorated tomb chest also exist but most of it is below ground. There are several other decorated stones within the graveyard including one with an interlaced cross. The Cistercian Abbey of Duiske, at Graiguenamanagh (S709437) was founded in 1204 by William Marshall, Earl of Leinster. It is a daughter house of Stanley, Wiltshire, and received its charter in 1207. It was dissolved in 1536 and two years later the property passed to the Earl of Ormond. The last abbot was Charles Kavanagh. In 1813 the ruins of the chancel, transepts and parts of the nave were re-roofed and restored. In 1886 the west end of the church was restored and partly rebuilt. During these restorations the original floor level was raised by about 2m. During the 1970s further restorations were undertaken and the building is now the local parish church. Although it was not possible to reinstate the original floor level several sections may be viewed. These have some fine medieval tiles. In the baptistry, off the south aisle, is a very fine doorway of early 13th century date. In the graveyard to the east of the church are two small granite High Crosses. One cross, originally from Ballyogan, shows King David, the Sacrifice of Isaac, the Fall of Man and the Crucifixion on the east side, and the Annunciation and Visitation on the west. The other cross, from Aghailta, has a Crucifixion and interlacings. A short distance south of the church, near the bridge, is a small five-bay two-storey market house. On the other side of the bridge, near the navigation lock, is the ruin of a small tower-house. Jerpoint Abbey (S573402) was explored. It may have been originally founded in 1160 by Donal MacGillapatrick I, King of Ossory, for the Benedictines. In 1180 it was colonised by Cistercian monks from Baltinglass. Jerpoint became the mother house for abbeys at Kilcooly and Killenny. In 1227 it became affiliated to Fountains Abbey in Yorkshire. At the Dissolution of the Monasteries it was proposed that the monks continue at Jerpoint and that they adopt a secular role to serve as a house of hospitality. This proposal was rejected and the property was granted to James, Earl of Ormond. There are extensive remains of a cruciform church, cloister and east range. The 15th century cloister arcade has been reconstructed on the south and west. The arches of the arcade are round and are in groups of three. The pillars of the arches are dumbbell-shaped in cross-section. The flat faces of many of these pillars have high relief carvings featuring clerics, knights and grotesques. Many of the capitals and bases of the pillars are also carved. At the north east corner of the cloister is a carving of St Christopher. The church has two east chapels in each of the transepts and the crenellated tower stands to full height. There is a large traceried three-light east window which has replaced some narrow lancets. Traces of these may be seen. The north aisle of the nave has an arcade of six arches, the pillars of which have all different designs. The capitals of the pillars are richly decorated. The wall above the arcade is pierced by large round-headed windows. Only the bases of the pillars of the south aisle arcade still exist. There are three round-headed lancets in the west wall. There are a number of tomb chests within the church. These are richly decorated with saintly weepers and there are some high relief effigies. There are also some slabs with incised effigies and other decoration. In the south wall of the chancel is a triple sedilia and a double piscina. In the north wall are three tomb niches. At Knocktopher (S533372) there is a fragment of a church. There are some sections of a wall with a window and most of a tower. This is all that remains of the medieval church of St David. Under the tower is a double-effigy tomb, dating from the 14th or 15th century, and some early carved stones. The tower is square at the bottom and the octagonal top may be relatively modern. The arch of the tower is Romanesque and probably dates from the 12th century. At Aghaviller (S497351) the Round Tower is the only remnant of the Early Christian monastery, the history of which is almost unknown. It may have been founded by St Brendan of Birr (d. c570) and Abbot Caroc died in 896. The tower still stands to a height of 9.6m and there is a good round-headed doorway. This is about 1.7m high and about 4m above ground level. It has a plain flat moulding. There is a comparatively modern square-headed doorway at ground level. The large rectangular tower nearby may have been built as a church in the 12th or 13th century. It was probably fortified about 1600 when the vault and top storey were constructed. The large windows were reduced in size for defensive purposes. Some time later the building may have been used again as a church. A straight stairway in the north wall leads to above the vault where there is a fireplace. Most of St Canice's Cathedral, Kilkenny (S502563) was built in the late 13th century. The tower was added in the 14th century after the original tower fell in 1332. The building was considerably restored in the 1860s. It houses a fine collection of 16th and 17th century memorials many of which have high relief effigies and weepers. The floor is covered with trapezoidal stones with floreated crosses and raised letter inscriptions. The Round Tower beside the Cathedral is all that remains of an early foundation. It may have been founded by St Canice who died in 600 but nothing is known of its history. The church was burned in 1085 and in 1114 and finally replaced by the present cathedral. The height of the tower is 30.2m and there are eight storeys including the basement. The round-headed doorway is about 3m above ground level. Kilkenny Castle was first built in 1204 by William the Marshall. It was a large square structure with large round towers at the corners. It retained much of its original form until the Cromwellian period when the south east range was greatly damaged. After the Restoration the ruined section was levelled to give a view over the parkland to the east and the remaining building was Frenchified by the 1st Duke of Ormond. Some rebuilding was undertaken towards the end of the 18th century and substantial restoration was carried out during the 19th century. The castle was the chief seat of the Butler earls, dukes and marquisses of Ormond from 1391 to 1936. In Parliament Street is the arcaded Tholsel, erected in 1761 as the Exchange and Town Hall. Further along the street is the Court House and Bridewell, a good Classical building of 1794. Opposite this is the Rothe House, a fine double-court house, built for John Rothe in 1594. In Abbey Street is Black Abbey Dominican Church.It is the church of the Dominican Friary of the Most Holy Trinity, founded about 1225 by William the Marshall. The present church consists of the nave and south transept of the original church and is still in use by the Dominicans. Outside are several stone coffins and a damaged effigy. Inside is a medieval alabaster statue of the Trinity. Elsewhere in the town are the remains of St Francis' Friary, founded by Richard the Marshall in 1232, and of St John's Priory, founded by William Marshall the younger for the Canons Regular of St Augustine. Dunmore Cave is known in the Old Irish literature as one of the darkest places in Ireland and is where Lichtigern, the Lord of the Mice, was slain. In 928 the cave was plundered by Godfrey and the Vikings of Dublin. During this raid 1000 people were slain. Excavations revealed many human bones which may be the remains of some of the victims. Also coins and coin fragments were recovered. The caves contain many splendid limestone formations including the Market Cross, a huge stalagmite in the middle of the triangular chamber. The church at Freshford (S406648) has a four-order Romanesque doorway surmounted by a triangular hood and above this is a circular Romanesque window with chevron decoration. The outer order is carried on double columns the capitals of which are a series of carved heads, both human and animal. The arch has key-type decoration. The middle two orders have chevron decoration and the inner arch is plain with an inscription. On the inner faces of the inclined jambs are recesses which may have contained carvings ( two figures are still in place). Ballylarkin Church (S387637) is small and almost square. There is a triple sedilia in the south wall. It is very plain but the finial at the east end is carved like a small traceried window. Above the sedilia is a pierced stone projecting from the wall. There is a similar stone in the north wall. Along the top of the north and south walls is a series of corbel-stones with carvings of window tracery. Beside the sedilia is a piscina with a quatrefoil basin. There is an ambry beside the east window and a doorway in the north wall. A pile of rubble and some marks on the wall indicate that there was a building attached to the west end of the church. This may have been a residential tower.